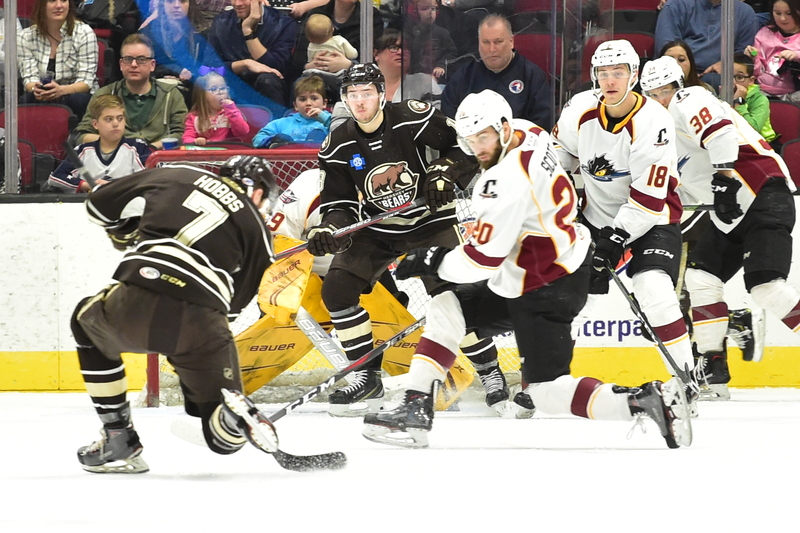 The Hershey Bears fell to the Cleveland Monsters 4-1 Sunday afternoon at Quicken Loans Arena in Cleveland. The loss drops the Bears record to 36-24-3-4 (79 points) on the season. The Bears are back in action Saturday when they host the Providence Bruins at Giant Center. Puck drop is set for 7:00 PM. Scratches: Kris Bindulis (upper body), Lucas Johansen (upper body) and Hampus Gustafsson (illness) were the injury scratches. Juuso Ikonen, Joe Snively were the healthy scratches. Defenseman Tyler Lewington was recalled by the Capitals on Saturday and did not make the trip to Cleveland. The Bears and Monsters skated to a scoreless draw in the first 20 minutes. The Bears had their chances, outshooting the Monsters 17-8 in the opening frame. The Bears were 0 for 1 and the Monsters 0 for 0 on th power play in the first period. The Monsters would break the seal with a power play goal from Tommy Cross at 3:48 of the middle frame. The Monsters would add a short-handed goal late in the second period from Sam Vigneault at 16:45 to make it 2-0. The period would end with the Monsters leading 2-0. The Monsters outshot the Bears 17-11 for the second period. The Bears were 0 for 2 and the Monsters 1 for 2 on the power play after 40 minutes of play. The Bears would get on the scoreboard early in the final frame with a goal from Max Kammerer at 2:50 of the final frame. Brian Pinho (7) and Ryan Sproul (16) were credited with the helpers. The Monsters would restore their two goal lead with a break away goal from Alexandre Texier at 10:10 of the final frame. Jonas Siegenthaler would fan on a puck at the Monster’s blueline that led to the Monsters break away. The Monsters were called for a four-minute high-sticking penalty with less than eight minutes remaining, giving the Bears an extended power play, but the Bears were unable to capitalize. The Monsters would add an empty net goal from Zac Dalpe at 18:40 of the final frame, to make it 4-1. Max Kammerer’s goal was his second of the season and his first since December 8th. The Bears outshot the Monsters 39-33 for the game. Ryan Sproul led the Bears in shots with 5. The Bears were 0 for 4 and the Monsters 1 for 2 on the power play for the game. This entry was posted in Hershey Bears, News and tagged Cleveland Monsters, Hershey Bears, Jon Sorensen, Max Kammerer. Bookmark the permalink.